The incredible rise of Brazilian football team Chapecoense has reached a "tragic ending", after a plane crash in Colombia killed the majority of their team. Six people survived the crash in Medellin, which was taking the team to compete in the first leg of the Copa Sudamericana final on Wednesday. They include defenders Alan Ruschel and Helio Zemper, and reserve goalkeeper Jakson Follman. The club's coaching staff and journalists were among the 77 passengers. 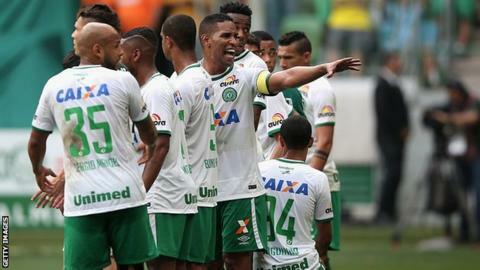 Chapecoense were in the Brazilian fourth tier in 2009, but had recently made themselves a "national force" before their run in South American football's secondary continental competition - the equivalent of the Europa League. BBC Brasil's Fernando Duarte said: "Their story is a fantastic fairytale, but now it has reached a tragic end." The football world has paid tribute, with players such as Brazil and Chelsea defender David Luiz counting former team-mates among those who lost their lives. Teams in Brazil have said they will give players to Chapecoense so that they can continue as a club. The club from southern Brazil were founded in 1973 and only won promotion to the country's top division in 2014, but victory over two legs in their first continental final would have seen them qualify for the Copa Libertadores, South America's premier competition. The Brazilian Football Confederation has announced a seven-day mourning period, during which all matches have been postponed, while the Brazilian government has declared three days of mourning nationwide. Chapecoense's "Leicester City-like run" in the Sudamericana was described as "a massive achievement for a very small club" by Duarte. The president of Chapecoense's guiding committee, David de Nes Filho, summed up the sentiment at the club in an interview on Brazilian radio station Radio Globo. "It was not just a group founded on mutual respect; it was a family," he said. "We lived in harmony, with great happiness. Before boarding the flight, they said they were going to turn their dreams into reality. The dream ended this morning." Clubs - including Chelsea, Barcelona and Real Madrid - paid tribute to the victims during training, and a minute's silence was held at both EFL Cup quarter-final matches in England on Tuesday. Meanwhile, Al Jazira and Al Shabab held minute silences for Chapecoense boss Caio Junior, who managed both Arabian Gulf League clubs. This is a club that as recently as 2009 were still in Brazil's fourth division. It is only in the last three years that they have established themselves as a national force. This was to have been the biggest game in the club's history. Now we wait anxiously to find out how many players have survived this terrible accident. The Copa Sudamericana is the second biggest cup competition in South American football, to have reached the final, after coming from Brazil's fourth division, in just six or seven years is a truly remarkable achievement which seems to have been interrupted by this terrible tragedy. Chapecoense statement: "May God be with our athletes, officials, journalists and other guests travelling with our delegation." Chapecoense's Argentine striker Alejandro Martinuccio did not make the trip because of injury. "Pray for my companions please," he tweeted. World governing body Fifa: "Our thoughts are with the victims, their families, fans of Chapecoense and media organisations in Brazil on this tragic day." Fifa president Gianni Infantino: "This is a very, very sad day for football. At this difficult time our thoughts are with the victims, their families and friends. Fifa would like to extend its most heartfelt condolences to the fans of Chapecoense, the football community and media organisations concerned in Brazil." Former Brazil international and two-time world player of the year Ronaldinho: "Power to the families and friends of all people who were on this plane! May God comfort you in this time of grief!" Former Brazil forward Kaka: "My prayers for today's tragedy, I ask God to comfort the family, friends and involved. My deepest feeling." Atletico Madrid: "Shocked by the accident of the plane in which the Chapecoense and our ex-player Cleber Santana travelled." Both Real Madrid and Barcelona held a minute's silence before Tuesday's training. Real said: "Real Madrid expresses its sorrow at the tragic air crash involving the Brazilian club Chapecoense and extends its condolences to relatives and friends of the victims. At the same time, we are wishing an early recovery for the survivors." Chelsea and Brazil defender David Luiz was a former team-mate of Chapecoense player Arthur Maia. He said on Instagram: "To wake up and know that you are no longer among us, with this news that breaks hearts around the world I can not believe it!" Luiz's club and national team-mate Willian: "God have mercy on the people who are there and give strength to all family members." Liverpool and Brazil midfielder Lucas Leiva: "God bless all these people that were in this terrible accident." Argentina and Barcelona star Lionel Messi posted on Facebook: "My deepest condolences go to all of the families, friends and supporters of the Chapecoense squad. #FuerzaChape." Manchester United were involved in the Munich air disaster in 1958, as 23 people were killed, including eight United players. Sir Bobby Charlton and Sir Matt Busby were among the survivors. Torino lost their entire first team to a plane crash in Turin, 1949. Peruvian club Alianza Lima lost their entire first-team squad when their plane crashed into the Pacific Ocean in 1987. The Zambia national team suffered the same fate in 1993 when their aircraft crashed into the sea off Gabon.